Lori Pickert, author of Project-Based Home Schooling and one of my home ed heroes, suggested on Twitter that this essay, "The Six-Lesson Schoolteacher" by John Taylor Gatto (another of my home ed heroes and New York State Teacher of the Year, 1991) is a good thing to read following the U.S. election. In it, Mr Gatto says,"Teaching means many different things, but six lessons are common to schoolteaching from Harlem to Hollywood. You pay for these lessons in more ways than you can imagine, so you might as well know what they are. The first lesson I teach is: "Stay in the class where you belong." "The second lesson I teach kids is to turn on and off like a light switch .... Nothing important is ever finished in my class, nor in any other class I know of." "The third lesson I teach you is to surrender your will to a predestined chain of command. Rights may be granted or withheld, by authority, without appeal." "The fourth lesson I teach is that only I determine what curriculum you will study .... Curiosity has no important place in my work, only conformity .... This is another way I teach the lesson of dependency. Good people wait for a teacher to tell them what to do. This is the most important lesson of all, that we must wait for other people, better trained than ourselves, to make the meanings of our lives." "In lesson five I teach that your self-respect should depend on an observer's measure of your worth .... children should not trust themselves or their parents, but must rely on the evaluation of certified officials. People need to be told what they are worth." "In lesson six I teach children that they are being watched .... Students are encouraged to tattle on each other, even to tattle on their parents .... The lesson of constant surveillance is that no one can be trusted, that privacy is not legitimate .... Children must be closely watched if you want to keep a society under central control." "It only takes about 50 contact hours to transmit basic literacy and math skills well enough that kids can be self-teachers from then on. The cry for "basic skills" practice is a smokescreen behind which schools pre-empt the time of children for twelve years and teach them the six lessons I've just taught you .... "School" is an essential support system for a vision of social engineering that condemns most people to be subordinate stones in a pyramid that narrows to a control point as it ascends. "School" is an artifice which makes such a pyramidal social order seem inevitable .... Look again at the six lessons of school. This is training for permanent underclasses, people who are to be deprived forever of finding the center of their own special genius .... Nobody survives the Six-Lesson Curriculum unscathed, not even the instructors. The method is deeply and profoundly anti-educational .... School is like starting life with a 12-year jail sentence in which bad habits are the only curriculum truly learned. I teach school and win awards doing it. I should know." For more, read the full essay. 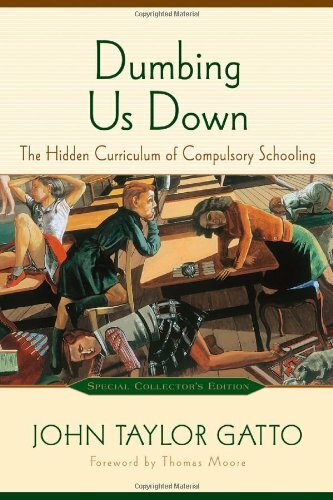 I also highly recommend John Taylor Gatto's book: Dumbing us Down.